America's third political party, the New Founding Fathers of America, comes to power and conducts an experiment: no laws for 12 hours on Staten Island. Back in 2013, The Purge introduced us to its titular concept. Once a year for 12 hours, Americans can indulge in any and all form of crime they desire under an event called “The Purge”. While the 2013 film shows us a US in which this policy has been in effect for a few years, 2018’s The First Purge offers a prequel that lets us see how the idea took effect. In the US, a political party called the “New Founding Fathers of America” (NFFA) takes power. To combat crime rates, they attempt an experiment in which they allow all crime for 12 hours in Staten Island. No one must stay there, but anyone who does gets a $5000 bonus. Various forms of mayhem ensue. At the very least, the original Purge offered an intriguing concept, and one that seemed a bit ahead of its time. At the risk of going political, the notion of the Purge seems like an idea custom-built for the Trump era. First Purge taps into some of that circa 2018 anger, though it doesn’t clearly connect to the current rosy economic situation. The movie’s US suffers from serious financial issues, whereas real-life animosity in 2018 mainly revolves around issues other than monetary or job-related. Still, First Purge clearly works to evoke the Trump era, as its NFFA politicians feel right in line with the MAGA crew. The film doesn’t pour on that side of things too heavily, though, which I appreciate, as I prefer subtle commentary to something more on the nose. In truth, First Purge barely spends time on the social ramifications of its concept, as it mostly functions as an urban thriller. 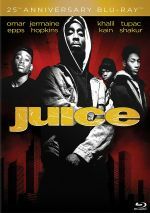 The movie has more in common with films like Boyz n the Hood or Juice than the prior Purge tales, honestly, and that seems like a flawed choice. First Purge doesn’t connect to the main theme all that well, so instead, we follow a handful of generic African-American characters such as drug kingpin Dmitri (Y'lan Noel). None of these roles feel creative or involving, so they simply flesh out the basic narrative and not much more. All of this feels like a missed opportunity. Any stabs at social commentary seem half-hearted, and the pursuit of the basic Purge concept doesn’t play out in a memorable way. The majority of the story simply acts as an excuse for ample amounts of graphic violence. All of this leaves First Purge as a pretty forgettable prequel. The concept of the Purge’s “origin story” comes with intrigue, but the end result fails to deliver anything especially engaging. The First Purge appears in an aspect ratio of approximately 2.39:1 on this Blu-ray Disc. While not a bad image, it seemed a little less satisfying than expected. Sharpness became the main semi-weakness, as parts of the movie looked softer than expected. This wasn’t a major issue, but I thought the film could seem oddly ill-defined on occasion. The image lacked any signs of jagged edges or moiré effects, and edge haloes remained absent. Print flaws also failed to appear. In terms of palette, First Purge heavily emphasized a teal impression. It also threw in some orange at times along with more dynamic hues during party scenes, but the heavy blue-green tint dominated. This left the hues as acceptable but not impressive. Blacks were reasonably deep, while shadows showed mostly positive delineation, though some low-light shots could seem a little dense. Overall, the movie remained watchable but it didn’t really impress. Downconverted to DTS-HD MA 7.1, the film’s DTS X soundtrack seemed more than acceptable but not especially memorable. A general sense of creepy ambience dominated the mix, as it didn’t boast a ton of genuinely involving sequences. That said, a few more action-oriented scenes managed to open up the soundscape in a pretty solid manner, and these used the various speakers to place us in the circumstances. Segments of this sort simply didn’t occur often enough to make this a consistently engaging mix, though. Audio quality worked fine, with speech that appeared natural and concise. Music showed nice range and heft, as the score felt vivid and full. Effects followed suit, as those elements boasted positive accuracy and dynamics. As mentioned they didn’t get a lot of room to shine, but they still demonstrated appropriate reproduction. This became a good but not great mix. One Deleted Scene lasts one minute, 47 seconds. It shows characters as they get through the Purge, with one notable character conflict. It works fine one its own. Three featurettes follow, and A Radical Experiment goes for four minutes, 57 seconds. It includes comments from producers Sebastien K. LeMercier and Jason Blum, director Gerard McMurray, and actors Lex Scott Davis, Mugga, Joivan Wade, Luna Lauren Velez, Rotimi Paul, and Y’lan Noel. “Experiment” offers basics about the movie’s story and characters. It’s not very informative. Bringing the Chaos goes for one minute, 24 seconds and features Blum, Noel, Davis, and stunt coordinator Hank Amos. It brings brief thoughts about stunts and violence. A few nuggets emerge but “Chaos” runs too short to tell us much. Finally, The Masks of The First Purge fills one minute, 22 seconds with notes from McMurray, Mugga, Davis, Noel, Blum, and actors Patch Darragh and Kevin Carrigan. As expected, we get brief notes about masks and costumes in this largely insubstantial reel. The disc opens with ads for The Purge TV series, Halloween (2018), Death Race: Beyond Anarchy and Mile 22. No trailer for First Purge appears here. As a prequel, The First Purge shows promise but the end result never goes much of anywhere. The movie fails to explore its basic concept in a satisfying manner so the film becomes one-dimensional and forgettable. The Blu-ray offers acceptable picture and audio as well as minor supplements. Purge fans might enjoy this prequel, but it left me disappointed.